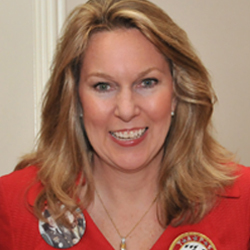 Following the death of her husband, Brigadier General Tom Carroll, in an Army C-12 plane crash in 1992, Bonnie Carroll founded the Tragedy Assistance Program for Survivors (TAPS) to provide peer based emotional support, grief and trauma resources and information, casualty casework assistance and crisis intervention for all those affected by the death of a loved one serving in, or in support of, the armed forces. Carroll currently serves on the Defense Health Board and the Military Spouse Employment Partnership, and has served on the Department of Veterans Affairs (VA) Advisory Committee on Disability Compensation, the Board of Directors of the Association of Death Education and Counseling, the Department of Defense (DOD) Military Family Readiness Council and, recently, she co-chaired the DOD Task Force on the Prevention of Suicide in the Armed Forces. She retired as a Major in the Air Force Reserve where she has served as Chief, Casualty Operations, HQ USAF. Prior to joining the USAFR, Major Carroll served 16 years in the Air National Guard as a Transportation Officer, Logistics Officer and Executive Officer. She is a trained Critical Incident Stress Debriefer and member of the International Society for Traumatic Stress Studies and the American Association for Death Education and Counseling. Carroll is the leading voice on issues impacting families of the fallen. TAPS has been one of IAVA’s closest allies and the two organizations have partnered on programs and efforts over the past decade that have already impacted countless lives.